I've never had much patience for Tetris. It's not just Tetris, mind you, but pretty much any game that falls into the broad category of "usually brightly-colored, abstract pattern matching games." (And Sherlock doesn't count. That's a logic game.) I don't get an almost-sexual satisfaction in making blocks of similar colors merge and vanish. Lumines doesn't call to me. It's just something in my nature; I think I need a plot to really enjoy a game. Despite the fact that I don't love this type of game, I'm still capable of recognizing a good one when I see it. Enter Funpause Games. I recently read a review of their work, that compared them to Ambrosia Software. My love for Ambrosia's games is very well documented. So of course, I had to try some of their games. And you know what? The comparison is fairly apt. Like Ambrosia, Funpause seems to have a "house style": shiny, lots of attention paid to music and audio cues, and simple gameplay. Funpause calls Atlantis a "ball-matching game." I call it "Snood with more motion." Snood is a frighteningly addictive game with a quirky sensibility that is something like a cross between Space Invaders and Tetris. Essentially a port of the arcade game Puzzle Bobble, Snood is a strictly tactical game; there's no time element pressuring you to make a move. Atlantis has an implicit timer, yet is a much easier game than Snood. This isn't necessarily a bad thing in a casual game. 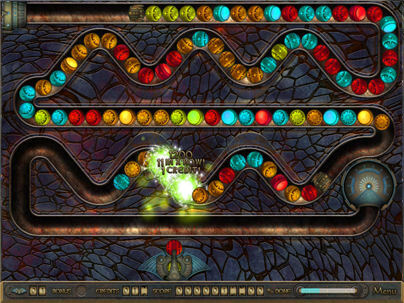 Brightly colored marbles are pushed down a channel towards an exit. You have a gun that shoots marbles up at the incoming stream. When your marble hits another marble, it becomes part of the stream. If by shooting a marble you create a string of 3 or more of the same color, the like-colored marbles disappear (and the incoming stream slows down accordingly). If enough marbles reach the end of the line, you lose a life. There is a system of upgrades and bonuses in Atlantis — clearly inspired by Arkanoid — but it doesn't really gel. It's more of a distraction from the core game than an enhancement. But the core game is good enough that I don't mind. Atlantis is available for both Mac and Windows, and a free demo (limited to one hour of play) is available for both platforms. I think it's a fun little diversion. Will you? Download it yourself and find out. Ahah, I've seen that before. I guess that style of game play is an archetype that they call "match 3 puzzle games". The first time I saw a shooter interpretation like this one was in Zuma, from PopCap games (who also made bejeweled, both of which are apparently available via live on the xbox 360), but there's literally a zillion of them out there. Still, fun trumps originally where this sort of thing is concerned. I could play this obsessively for days on end... if I didn't have to reboot. Perhaps this will inspire me to get WINE configured correctly. Or perhaps I can talk them into a native Linux version. Besides utilizing a well blended combination of thought and reflex, and providing intuitive, quick, gameplay, the soundscape of this game is compelling. I don't know when I last played a game of this sort that pulled me in so effectively with music and sound effects alone. I may now be hopelessly addicted to this game. You're right about the powerups, by the way -- they're kinda nice as a random "look, something weird happened" distraction, but the whole interface for buying powerups seems unnecessary and pointless. This is a great game download... following the footsteps of a similar game called Luxor.